At noon, Darwin lies 200 km behind us. We have entered Kakadu National Park. The blind have commenced to lead the blind, as Roger asks me for dirt road driving tips. It is true that I spent four years driving four-wheel drives around the NT but I also very successfully wrote off Kaylee’s Subaru on a dirt road in NSW, by spinning it 360 and rolling it back on to its wheels on the other side of the fence; some might argue that this makes me eminently qualified since the greatest cause of death in the NT is single vehicle roll-over…so my skills are clearly in keeping with NT driving. We are heading for Twin Falls where we have a permit to camp on top of those falls. At 3.30 pm we turn onto the Jim Jim Falls road. Where there used to be a beautiful bush track winding through the trees, the national parks service has now created a corrugated four lane dirt monstrosity. Such are the perils of re-visiting favourite spots 20 years on. We stop at the camp ground just 10 km from Jim Jim falls. We are sold a $12.50 ticket to take a boat trip up Twin Falls gorge. The cost is a rip-off but is apparently justified because one can no longer swim up the gorge, as we used to, due to saltwater crocs. Crocs in the gorge and sharks in the camp ground. I am under the illusion we need to take this boat to get to the start of the waterfall. Years ago we used to climb the scree slope on the far side of the plunge pool and walk from there to the top of Twin. We race to get the final boat which is advertised as departing at 5 pm. But when we arrive we discover the last boat departs at 4 pm. Fortunately we also discover the walk starts from the car park near Twin Falls, not from near the plunge pool as it used to do. It is success through chaos. I am nervous about the (short) day walk. My knees and ankles have got progressively worse over the last years, the heritage of too many football, skiing and running injuries. I am now a human melange with a 58 year old body, the standard chronologically challenged brain of any male and 80 year old knees and ankles, according to the knee specialist. There are four in our party….me, my partner, Kaylee MacKenzie and two very old friends Roger Horton and Jill Everett. Kaylee and I have travelled together extensively but we have not travelled as a group . We are conducting a social experiment in tolerance and learning. In many ways it is not the Odd Couple but the Odd Quartet. Roger is a tall, calm, tolerant red-head, in many ways the perfect traveling companion. Kaylee and Jill are highly excitable, exuberant individuals with a tendency to being highly stressed and a commensurate tendency to want things to be under control. They are both teachers…enough said. Being modest, I hesitate to describe my numerous qualities but I am blessed with a tendency towards order and loss. If I can give orders, I will, and I can lose almost any small items put into my care. We climb up the escarpment towards the top of Twin Falls. We are in full late evening sun, it is still 35 degrees plus in the sun. I have a sweat discharge rate high enough to fill Sydney harbour in about 2 hours (as Australians are wont to describe flow rates). We arrive in Twin Falls Creek as the sun is starting to set. It is just as I remembered; a little miracle of cool swimming holes, pure white sand, red rocks, cascades, bird life and orchids everywhere. Every bushwalkers idea of a perfect camp spot. And there are no mosquitoes worth talking about. The sun sets, doing its cliff reddening duties, as the moon rises. We laze in the water hole, Roger lights a small fire and Kaylee cooks Rat and couscous. We are part of the Gods of Small Things. It is July 6. We leave our camp site departing for Nourlangie Rock and Jabiru. On the way out we detour to what is advertised as the falls lookout. But the fall are beautifully hidden around a rock outcrop. No view of the falls. Lucky for the parks service that they are not a retailer or ACCC would have them for breakfast. While on top we discover two things; the National Parks Service should be sued for false advertising and Kaylee likes to keep her dress colour coordinated even in the bush. 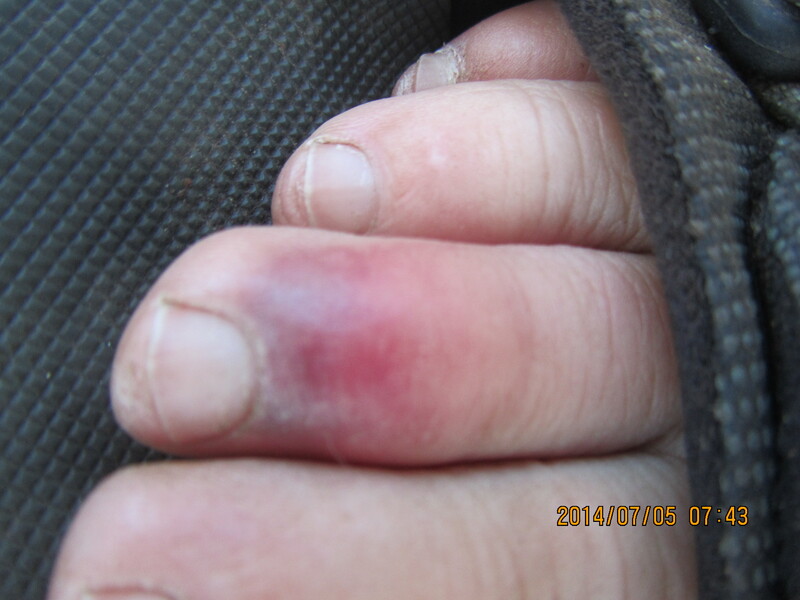 In an effort to coordinate her toenail colours with her shirt colours she bashes her toe on a rock. The resulting pink and purple colours coordinate with her shirt perfectly. It is July 6. We leave our camp site departing for Nourlangie Rock and Jabiru. On the way out we detour to what is advertised as the falls lookout. But the fall are beautifully hidden around a rock outcrop. No view of the falls. Lucky for the parks service that they are not a retailer or ACCC would have them for breakfast. On returning to the bottom of the escarpment we detour to take the $12.50 boat trip up the gorge. Dennis, the guide and boat driver, gives us a run-down of the gorge including the fact that they found a 3.5 metre saltie here a few years ago after it was opened to tourists and at the time swimming was still allowed. Hence we now have to take a boat and cannot swim in the falls plunge pool. All that water and nothing to swim in. It’s why few people visit Twin Falls these days. Next stop is Jim Jim Falls. It is just running and is crowded with visitors and swimmers. Swimming is still permitted immediatley below the falls as it is higher than the final plunge pool at Twin and the giant rocks provide a barrier to saltwater crocs. But it’s no longer the peaceful place it once was. Traveling Kakadu is like a permanent exercise in deja vu for me; I spend 3 years out here working for the Northern Land Council at its Parks and Tourism officer. In that role I advised traditional owners on general management issues and on the development of the new plan of management. Since I worked here visitor numbers appear to have risen about eight-fold. Everything is new and shiny and bound around with rules. Almost everything requires a permit, most major roads have been sealed, small campgrounds have become giant parking lots far removed from the beauty spots at which they were once located. They pulled down paradise and put up a parking lot. So it goes. Swept away with your lovely prose, photos Chris and imagining how lovely it is to be where you are. Kaylee your toes brings tears to my eyes, and I suspect will dovetail beautifully with a Kakadu sunset. Hope you are having a wonderful time and needless to say I would loveto be sharing some of the trip with you. And you know K that I do not think that she long for order and control- quite the opposite. Have fun. Thanks for your comments on the blog. I’m really sorry to hear about your cancer from Kaylee and fervently hope you make a full recovery. Thinking of you and your family and hope that the stories of Kaylee’s and my travels do something to lighten your day.